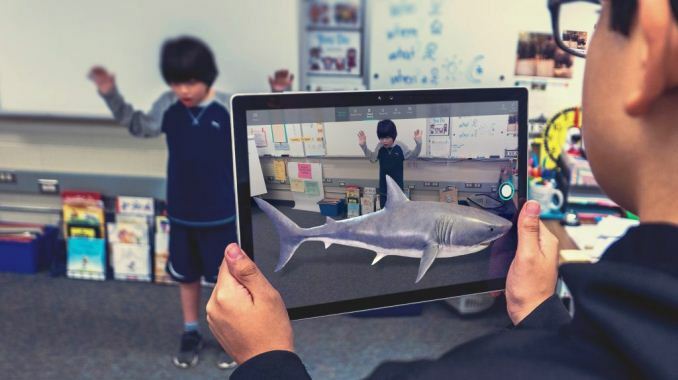 One of the headline features of the Fall Creators Update is Windows Mixed Reality, which is the umbrella term Microsoft uses to describe any of their Virtual Reality (VR) and Augmented Reality (AR) features. Windows has a strong case for VR/AR, since the best experiences are going to require the brute compute power of a PC, and Microsoft was one of the pioneers of AR with HoloLens, but it has to be said, this market is completely in flux right now. VR hasn’t taken off as quickly as many would have hoped, although AR has made some inroads in the smartphone market. As Microsoft often does, they’ve turned Mixed Reality into a platform, and that has had some immediate benefits. There’s now several VR headsets available from the major PC OEMs, hitting a couple of price points. Most of the headsets have resolutions of 2880x1440, with 90 Hz LCD panels, with the exception of the Samsung HMD Odyssey which is a 2880x1600 AMOLED headset. The headsets all include motion controllers as well. With the power of a PC behind it, a Windows Mixed Reality headset should be able to offer some great experiences, but the biggest issue is the lack of use cases. Gaming is the obvious one, but VR gaming hasn’t really taken off yet despite the launch of the HTC and Oculus VR headsets. AR does have some interesting use cases, and unlike VR doesn’t necessarily require a headset. Using the webcam on a device will allow the system to project images on the screen which appear to be in the real world, and this ties into the work done in Windows to support 3D animations and creations over the last couple of updates. Overall, Windows Mixed Reality still needs to prove itself. The tech is still new, and we’ve yet to see any amazing experiences which necessitate the purchase and use of a head-mounted display. VR is amazing to use, but limited in usefulness, and AR is somewhat in its infancy. The idea of standardizing all of this is a good one, and having a consistent platform should help drive adoption, but the tech is simply too immature in the market to predict if this will be the next big thing in Windows, or just another small feature. "One thing you still can’t do is actually view the site certificate. The information provided by Edge is very basic, with no option to open the certificate in the more advanced Windows certificate tools to check the trust chain"
Microsoft now has all the telemetry they need to improve their products for older hardware so why won't they turn it off? Because it's a Spyware Platform! You can't really spy on EVERYONE if you close all the backdoors.....DUH! and sending encrypted messages won't help you if the NSA is watching you type the message! I hope you don't use any Intel CPU's if you're that concerned about spy ware in your system. The Intel Management Engine or ME is spying on you even of your system is powered down.Google is working on a solution to kill the MINIX based ME, but they haven't figured out how to do it yet without disabling some of the CPU's features.